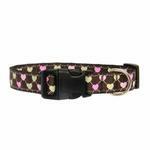 Dogs will look darling in the Argyle Hearts Dog Collar by Mirage! Multiple colored hearts on an argyle pattern. We love the hearts that carry an argyle pattern along the ribbon! 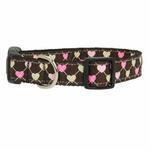 The Argyle Hearts Dog Collar is a nylon collar featuring a sewn-on ribbon. Thick plastic hardware and a sturdy metal D-ring makes this collar as dependable as it is fashionable. Matching leash sold separately. Argyle Hearts Dog Collar - Brown Customer Photos - Send us your photo! Posted On 01/16/17 by Angela B from Trenton, OH Yes, Angela B recommends this product! This looks cute on my maddie and easy off easy on. Love the hearts and colors & easy to put on & off & looks darling on my Airedale. I did not care for this collar it looked much better online than in person. I returned it and will reorder another style. Posted On 10/12/16 by Eileen F from , NY Yes, Eileen F recommends this product! Collar is very cute but it's too wide for my pup she is petite and it seems to over power her. Unfortunately need to return. Posted On 03/28/16 by ANNA S from Owasso, OK Yes, ANNA S recommends this product! This is absolutely the 'right' collar for this dog of my granddaughters. My granddaughter was pleased as well. 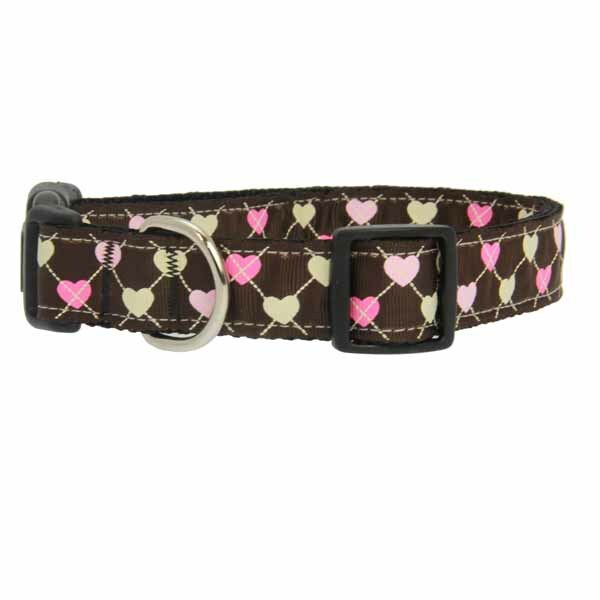 It fit Sugar just right as she is a Cocker Spaniel and has a lovely brown coat, this collar is brown and with the hearts they stand out!!! Posted On 03/10/16 by Marilyn D from Staten Island , NY Yes, Marilyn D recommends this product! I purchased this for my dog but it was too small. I gave it to my sister for her dog and it looks absolutely gorgeous on her. Posted On 05/14/15 by Bree from Charlotte, NC Yes, Bree recommends this product! This collar is the perfect fit for my medium/large size dog. I was specifically looking for a collar that was one inch wide. Most one inch collars come in large sizes only. I was happy when I found the medium size for this collar came in the one inch width. Good quality. Looks great on my dog. Thanks BaxterBoo for the wonderful selection of products you carry for pets. Posted On 04/29/15 by Cindy F from Grapevine, TX Yes, Cindy F recommends this product! At first this collar looked so small that I thought it wouldn't fit, it was XS, but once adjusted it fit perfectly. I love the colors, well constructed and for my tiny girl it is just perfect!